In addition to serving as an online auction marketplace for ideal real estate deals, Bid4Assets also provides a platform for real estate sellers. This guide will provide you with the tools and information you need to apply for our seller program, create your first listing and manage settlement of your sales. Start getting more from your investments today. 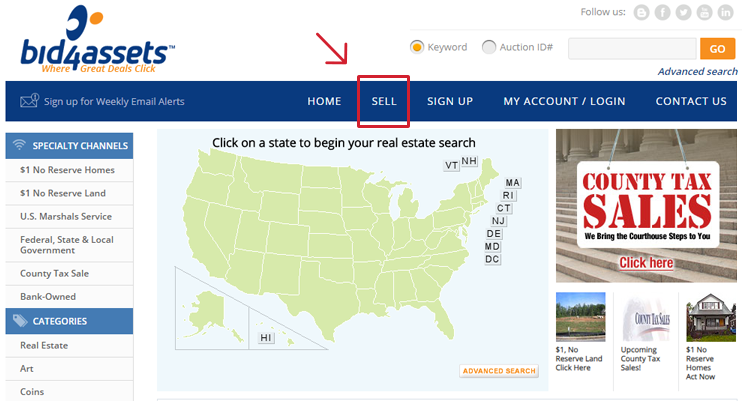 The first step to becoming a seller on Bid4Assets is to register for a free Bid4Assets account. An account gives you the ability to bid on all private auctions across the Bid4Assets platform. It also allows you to submit deposits for all government auctions and gives you the ability to apply for the Bid4Assets seller program. For a full guide to registration click here. This will take you to the seller application page. Fill out the basic information requested on this page then click “Submit Application.” This will send your application to our client services team for review. You will be notified via email whether you are cleared to proceed in the application process within the next two to three business days. If you are not cleared to proceed, you are welcome to apply again at any time. After your application is cleared to move forward, the next step is to go through Bid4Assets’ ID Verification screening. All sellers on Bid4Assets are authorized through an ID Verification. The process is free, quick and secure, and does not influence your consumer file or credit score. Once your application has been approved, you will be contacted by a Bid4Assets representative with instructions to begin ID Verification. If you intend to list primarily as a corporate entity, you will need to fill out a corporate verification form. 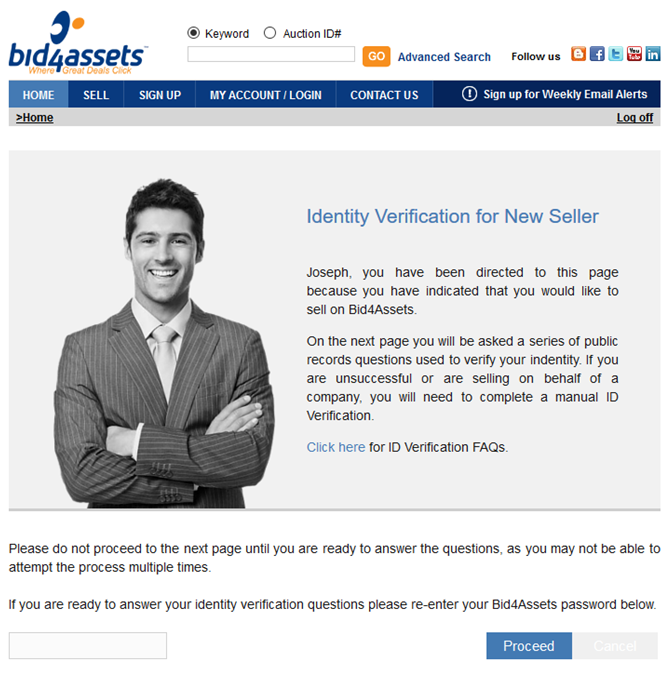 Once you pass the ID Verification screening you will be cleared to list on Bid4Assets! 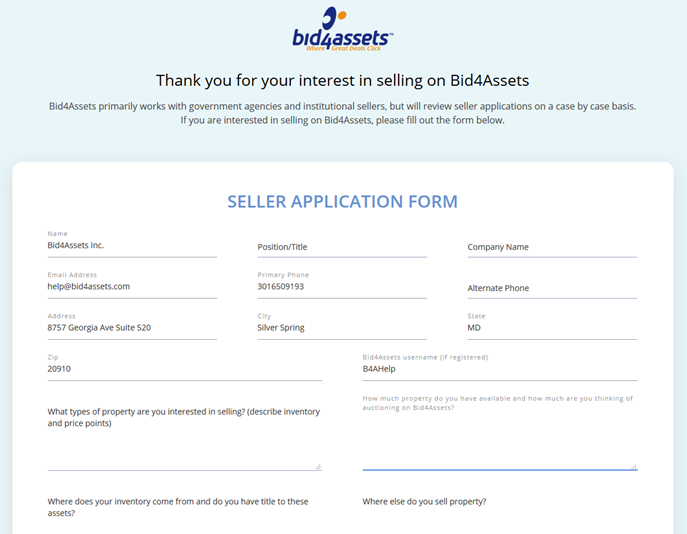 Sellers list their auctions using Bid4Assets’ EZ Lister tool. The EZ Lister listing tool, a very convenient, single page listing form, includes an HTML editor, a one-click photo upload tool, and the ability to insert information from previous auctions. 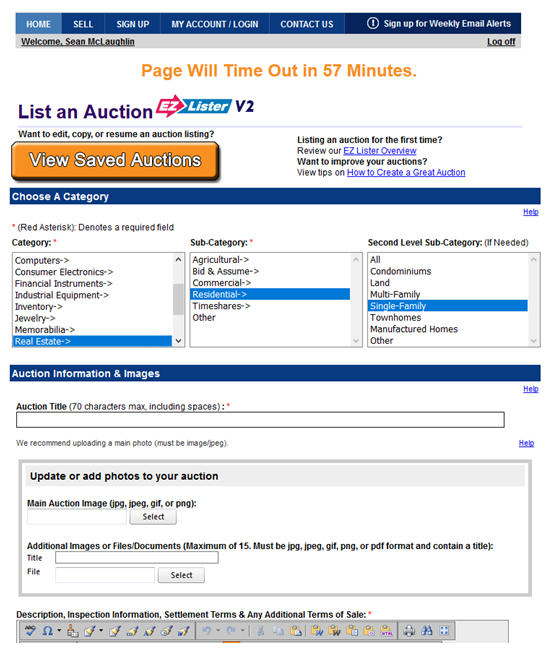 The auction listing process takes between 5 and 20 minutes (based on the number of photos and additional information you include) using our EZ Lister listing tool. If you start an auction using EZ Lister, but do not complete it, you can resume creation of the auction by clicking on the “Resume a Listing in Process” link in EZ Lister.